What Are Some of the Self Pollinating Vegetable Plants? Most plants need help getting their flowers fertilized to produce viable seeds, and they depend on bees or other insects for this important job. When pollen and nectar-loving insects move from one flower to another, pollen collects on their bodies. Then pollen is transferred from the male part of one flower to the female part of another flower and fertilization occurs. Some plants, including some vegetable plants, are self-pollinating, meaning the flowers have not only male parts, but female parts that are receptive to pollen from the same plant. Self-pollinating plants do not need insect help for pollination, although you may see a variety of pollen eating insects in and around the flowers when they are in bloom. Lima beans produce a perfect flower that has both male and receptive female parts and can be pollinated by wind movement. Lima bean flowers produce lots of nectar that attracts bees and wasps, however. This often causes self-pollination between bean species unless the plants are caged so insects cannot have access to the flowers. Lettuce produces a tall flower spike that allows pollen to fall from one flower to another to ensure fertilization. Also, there are structures similar to leaves that form at the bottom of the flower spike that gather pollen then curl inward toward the flower spike so the pollen has contact with the flowers. Tomatoes are considered self-pollinating because they can pollinate themselves by simply allowing the pollen to fall or drift from the flowers on each plant to other flowers on the same plant. However, the process works much better if there is some agitation provided by the wind or something else that causes some plant movement. That is why many greenhouse operations have a system set up that taps or vibrates the tomato plants and helps the flowers release pollen so all the blooms on the plants are fertilized. English peas are self pollinating as the light pollen moves easily within the flower's male and female parts and to the other flowers on the vine. Since English Peas are a cool weather crop, there are not many pollinators available to pollinate the plants, so self-pollination is an important characteristic for the survival of English Peas. 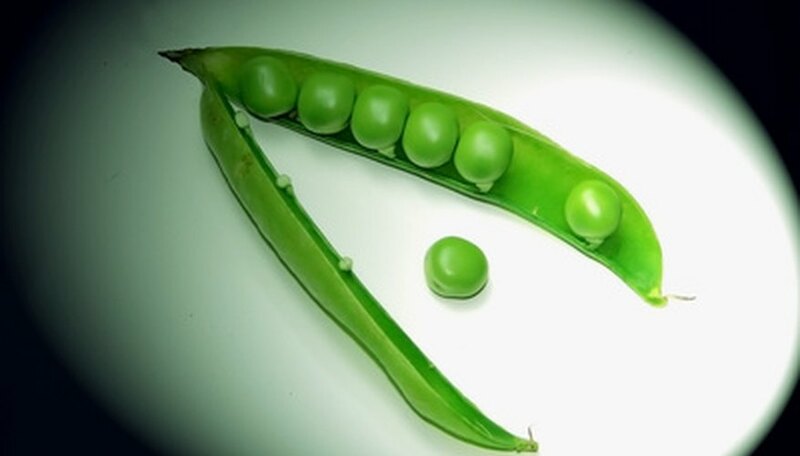 Southern peas include but are not limited to black-eyed peas, field peas, crowder peas and cream peas. They are grown in the Southern U.S. during the summer growing season. Like Lima beans, the flowers are capable of self-pollination and beans, or seed pods, can be produced without the help of pollinators. Unless the plants are isolated or covered, winged pollinators such as bees and wasps visit the flowers and spread the pollen to similar plant species creating cross-pollination of the species. Jay Golberg is a certified Texas nursery professional and professional project manager. He has 30 years of business and farming experience and holds bachelor's degrees in English writing from St. Edward's University and finance from Lamar University. What Part of a Plant Makes Pollen? What Is the Purpose of Flowers? What Adaptations Allow Seed Plants to Reproduce Without Standing Water? What Are Three Examples of Flowering Plants? Why Do Flowers Need to Be Pollinated? Why Do Bees Pollinate Flowers? Why Are Flowers Different Colors?